More than a slogan, it is our credo. We build steering wheels that match the enthusiasm of our drivers. Here is where the driver meets the vehicle…this is where the true connection is made, and we understand the desire to have the best look and feel in your hands. Like our drivers, each of our steering wheels has a unique personality giving our enthusiast the personalized style that they can call their own. Crafted from the best materials, we offer premium quality leather and wood steering wheels offered in a variety of different styles and colors. 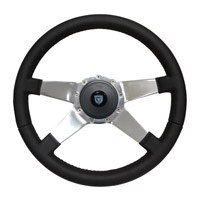 Volante has been a manufacturer and worldwide distributor of steering wheels since 2001 through their parent company Auto Pro USA, Inc., a leader in the restoration, performance and hot rod marketplace. If you have been a part of any of these industries over the last decade it is more than likely you have purchased or installed a quality part from their vast product line. Our mission is to be the leader in the market delivering the best value, originality and taste for our fellow enthusiasts. Volante is an ever growing brand offering a wide range of applications for the Domestic markets (i.e. GM, Ford and MOPAR). With our enthusiasts in mind, we are constantly in development with new styles. Please contact us or one of our retail distributors for more information on the Volante product line. We specialize in six bolt, nine bolt and OE Style steering wheels for GM, Ford, VW and MOPAR applications. We have the perfect hub to fit just about any column out in the market. Be sure to check out your specific vehicle for details. We stock OVER FIFTY Licensed Emblems and various horn button styles to choose from. You have the power to built your steering wheel kit the way you want it!